Stomach cancer develops from malignant cells in the lining of the stomach and is the third primary cause of deaths from cancer worldwide. It is often diagnosed at a late stage because of the absence of early symptoms. The SGC-7901 cell line was isolated from metastasis of untreated gastric adenocarcinoma of a 56-year-old Chinese female patient in 1979. SGC-7901 cells have been extensively employed as models for investigations on H pylori-induced gastric epithelial inflammatory responses. A 2008 SGC-7901 xenograft study published in Investigational New Drugs, demonstrates that CPT21, a semi-synthetic water-soluble analogue of camptothecin, displays an extensive anti-tumor spectrum and can induce the apoptosis of SGC-7901 cells via activating the caspases cascade followed by disrupting mitochondrion function. A 2011 study by Xu et al. 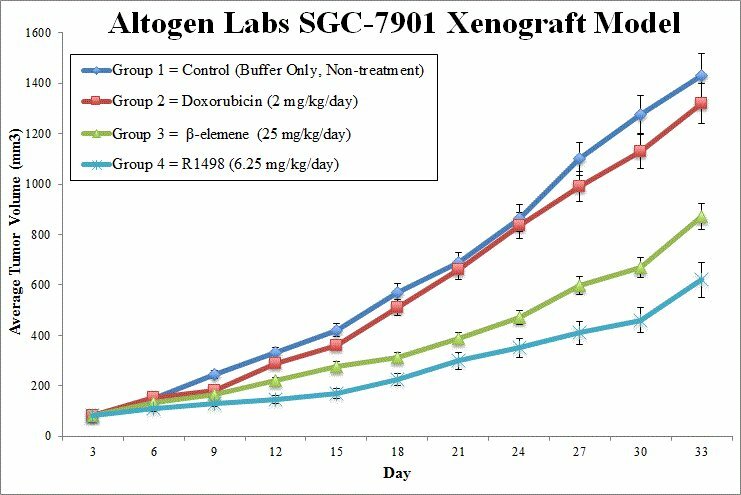 used the SGC-7901 xenograft model to test the efficacy and effects of darbufelone, a dual inhibitor of 5-lipoxygenase (5-LOX) and cyclooxygenase-2 (COX-2), on gastric carcinoma. Results demonstrated inhibition of tumor growth without observable cytotoxicity, downregulation of 5-LOX, COX-2, PCNA, and Bcl-2 and upregulation of caspase-3 (indicating induction of apoptosis). The last example study is by Wang et al. (2016) in which the group used the SGC-7901 xenograft model to study potential effects of Chinese bayberry fruit, rich in anthocyanins such as cyanidine-3-glucoside (C3G), on tumor growth. Results indicated that C3G suppressed tumor growth, upregulated KLF6 and p21 and decreased CDK4 and cyclin D1 expression, all of which is indicative of antiproliferative activity in gastric adenocarcinoma. The SGC-7901 cell line (human gastric) is used to create the CDX (Cell Line Derived Xenograft) SGC-7901 xenograft mouse model. The SGC-7901 xenograft model enables anti-tumor growth evaluation of extracts (e.g. anthocyanin C3G), kinase inhibitors (e.g. R1498) and anti-inflammatory agents (e.g. darbufelone). SGC-7901 cell viability and concentration is determined via trypan blue. One million cells are injected into the hind leg of nu/nu mice (10 to 12 weeks old). The Matrigel + SGC-7901 suspension is injected as 100 µL subcutaneous injections. All injection sites are monitored for tumor development via palpation three times a week. Tumors are continually measured (calipered) until tumor sizes in the range of 50-150 mm3is reached. Customer determined cohorts are established and test materials are injected as instructed. All tumor measurements (daily) and mouse body weights (3 times weekly) are logged. Maximum tumor size limits dictate the end of the in-life portion of the study, and animals are euthanized. All tissues collected are placed in microtubes and snap frozen (LN2) or stabilized (RNAlater), or placed in pre-filled 10% NBF containers. Animal handling and maintenance at the Altogen Labs facility is IACUC-regulated and GLP-compliant. Following acclimation to the vivarium environment, mice are sorted according to body mass. The animals are examined daily for tumor appearance and clinical signs. We provide detailed experimental procedures, health reports and data (all-inclusive report is provided to the client that includes methods, results, discussion and raw data along with statistical analysis). Additional services available include collection of tissue, histology, isolation of total protein or RNA and analysis of gene expression.